In September 2000, Vineyard Church of Marysville began as a home group. We were officially planted out of Vineyard Columbus. The original core team consisted of five couples, all long-time residents of Marysville and Union County. When our home group grew to approximately twenty adults, we started a second group. In January 2001, we began having Sunday evening gatherings at Mill Valley Elementary School, calling it, A Taste of Vineyard. We met at the Mill Valley Elementary School. 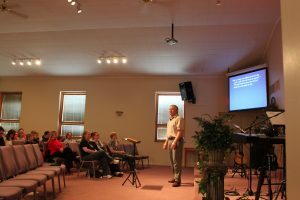 In September of that year, the attendance was approximately 60-65 people and there was a growing sense of excitement in what God was doing among us! In January 2002, we began meeting regularly on Sunday mornings. We were still meeting at the school at this time. We grew to approximately 100 people, with six small groups meeting in homes throughout the week. In April 2003, through a miraculous series of events, we were able to purchase our current 5th Street facility. The building has been a blessing to us over the years. We have grown to an average of 200-220 on a typical weekend. Even today, God continues to strengthen and lead us as a church! The Lord is stirring our hearts and doing new things in our midst! “Come, Holy Spirit,” we continue to pray, “Use us to bring more and more people to Jesus and advance your kingdom in Marysville and beyond!” That’s our history in a nutshell. We invite you to partner with us into the future; our story is still being written! Click here to if you want to know what to expect on Sunday mornings at the Vineyard.